The cult website, melsmall.com has been offline for over six months now. There is a reason or this. After spending the whole of this millennium working in the field of information technology, I decided that something was fundamentally flawed with a world of ones and zeros. I refused, any longer, to be defined by technological appurtenance. I consigned my laptop to landfill, fed my iPhone through a spice grinder and enshrined my collection of DAB radios in a shallow grave, just behind the shed at the bottom of the garden. None of that is true. What really happened is the arrangement for hosting of my various websites came to an end (thanks for the freebie, Mark) and I've been too busy to sort it out. As those of you who have wandered this way previously might spot, I have also took some time to make few enhancements to the site. Check out the funky dropdown menus. I've also updated all the database connections. Hopefully no one will spot this. If you do, I've cocked it up. So, actually, it wasn't so much Seven Years in Tibet that caused the down time, but rather six months in Doncaster. Anyway, what has really been happening? What have I been busy doing? The thing that has taken up a lot of my time, following its launch in July, is Indipenned. Indipenned is a social network for independent authors. It is a consequence of the experiences I had following the launch of my first book, the now legendary Holmes Volume 1 (ahem). What struck me back then was how helpful my fellow independent authors were and how great it would be if there was a dedicated social network for both them and those readers interested in literature other than that of the mass-market. Consequently, I spent the 2016 building one. Obviously, independent authors are already well-served by Facebook, Twitter and like, however, Indipenned has been developed to be specific to their needs and is exclusive to those working outside of the big publishing companies and their massive marketing budgets. It features an online bookshop, lists literary events and allows indie authors to post short stories, blogs and share their knowledge and experiences of the independent publishing industry. Each author (and for that matter every member) also gets their own section / home area within Indipenned, here's mine: www.indipenned.com/melsmall. Indipenned has been designed to be a meritocracy in which the cream of independent literature floats to the top. The order the books and other pages are displayed within the website is determined by a clever little algorithm designed by yours truly. Since its launch it has being growing steadily and has already gained some passionate supporters. I've also been busy doing a bit of writing. This has been a bit sporadic in terms of both the time I have been spending on it (building and promoting a social network kind of cuts into your time a bit) and the things I have been working on. At this stage I don't want to give out any spoilers, however the majority of my focus has been on two novels. One is something I'm calling a romantic black comedy, which is about a bloke whose life is falling apart, and the other is a meaning of life / technological armageddon type thing. Very cheery stuff. In the meantime, there's a couple of Sherlock-related things for you to get your peepers on. 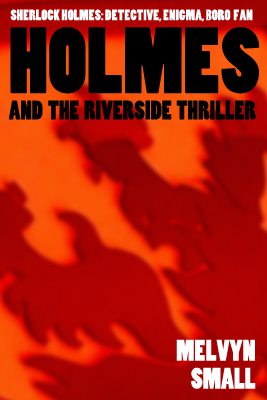 Holmes and the Riverside Thriller has now found its way on to Kindle. This is a story I wrote for serialisation across last season's Middlesbrough FC fanzine, Fly Me to the Moon. In hindsight, it was probably a rare source of entertainment for long-suffering Boro fans during the dismal 2016/17 Premier League campaign. Oh well, it's not like we aren't used to it. If that's not enough, I've also written a brand new Sherlock Holmes story, The Darlington Substitution. Again, and very much in the style of Sir Arthur Conan Doyle, it will published as a seriealisation. It's actually the longest Holmes story I've written so far and more of a novella really. At present, The Darlington Substitution is being proofread by a few of my intrepid band of unpaid proofreaders. Once it has passed their critcial gaze it will be available to read for free on Indipenned. If you would like an email notification when it hits the internet, please sign up to my Indipenned home page. That's it for now. I'm off to the pub... sorry ..gym, gym, I meant to say gym.